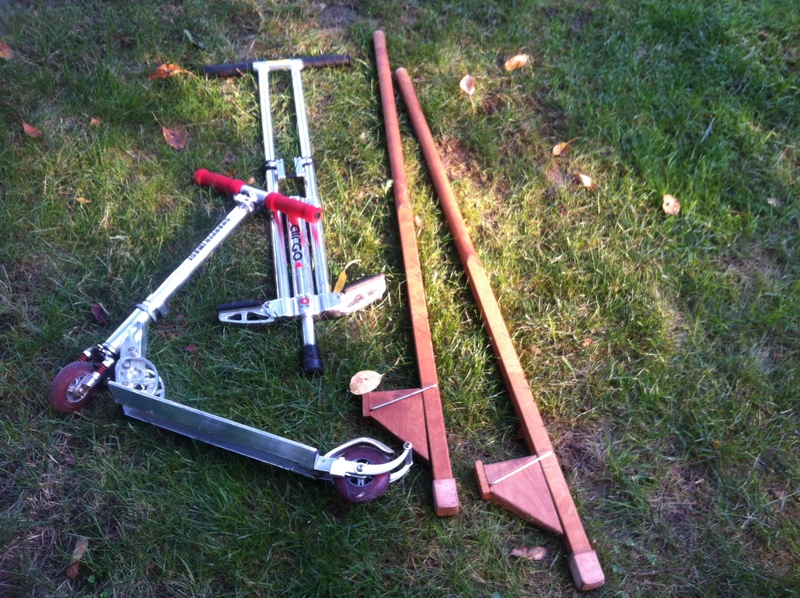 Talismans of Youth: A scooter, stilts and a pogo stick. I was minding my own business, hoisting the bottom half of a couch out of our garage in preparation for the AmVets truck pick-up, when Tim suggested that we give away a few other things. I nodded approval, because my idea of a good time includes getting rid of everything, and my idea of a great time is sweeping out a newly emptied garage. Tim carried out a couple of brass floor grates, a rusted wrought-iron table, and my heart. He didn’t actually hold my heart, of course. What he held was a set of stilts, a scooter, and a pogo stick. These were our younger daughter’s favorite toys, symbols of a childhood spent in constant motion: balancing, careening, and bouncing. Twelve years of soccer, six Varsity letters, and one Alaskan NOLS expedition later, she’s still a force of nature. But as she grew up, I grew accustomed to her adult pursuits, running and biking and exploring her way through life. One glance at these Talismans of her younger self reduced me to a nostalgic mess. That’s what parenting is, I guess. A series of matter-of-fact rituals occasionally interrupted by moments of overwhelming emotion. My husband took one look at me at chalked it up to menopause. But it was more than hormones gone awry in my sleep-deprived middle-aged body. Two days earlier, I’d spent the night in the hospital, keeping my eighty-year-old father company in the ICU following his hip replacement surgery. A life-long athlete at the national and even international level, my father’s hips and knees and ankles are now failing him, taunting him later in life after having served him so well. That night in the hospital, from the discomfort of my not-fully-reclinable Lazy-Boy bed, I found myself looking not at my father, pale from his surgery, but at his electronic monitor. Those brightly colored zig-zagging lines and beeping numbers offered more reassurance to me than the faint snores and coughs coming from his bed. I thought about the heart-stopping fear I used to feel, watching my daughter climb and jump and race through life, missing corners and edges and danger by the narrowest of margins. And I thought about the heart-stopping fear I felt now, worrying that my father’s heart would, in fact, stop. That’s what being a daughter is, I guess. A lifetime of counting on the presence of a parent, interrupted by the overwhelming emotion of acknowledging the inevitable. Nope. I reject that. Dad’s going to be fine. He’ll move from the hospital to rehab to home. He’ll swap the hospital bed for a walker, the walker for a cane, and then even the cane will be gone. That’s what being an optimist is about. The stubborn belief that moving forward is always good. I let the guys from AmVets take the stilts and the scooter and the pogo stick. But not before I snapped a picture. A gal needs a photo every now and then to remember these little moments. And then I rode my own bike to the hospital to visit my dad, who really is getting better. Sally–I love your writing. This one especially because I just spent the last 4 months going thru everything in my house, from basement to attic. Opened 10 boxes that were shipped to me over 10 yrs ago when my grandmother died! Crazy, huh? But not as crazy as going thru the college application process w/ my youngest. Lord, help me! And I had a hip replacement 8 months ago. I feel great now but the first month is brutal! I’m sure your dad appreciates your visits. Keep writing! I love it!